Andy Karl in the London production of "Groundhog Day"
The lead actor in the new musical "Groundhog Day" was injured Friday night minutes before the show's ending, causing the production to temporarily go dark while a call for doctors was placed to patrons at the August Wilson Theatre for assistance. Andy Karl, a Tony-nominated stage veteran of shows like "Rocky the musical," told fans on Instagram early Saturday morning that he fell during the production's second act — in a "poorly landed leap frog." The jump caused him to tweak his knee, Karl explained. He had no broken bones and plans to have his knee looked over by a specialist before he goes back on stage. "I love this show and this company and everyone that supports me more than you'll ever know," Karl wrote. "#theshowmustgoon." The Saturday afternoon performance of "Groundhog Day" has since been cancelled. Understudy Andrew Call will take on Karl's role at Saturday evening's performance. The production is still scheduled to open on Monday. NBC New York's theater reviewer Robert Kahn, who was at the show on Friday night, said seconds after the accident, actors were quickly asked to clear the stage — over loudspeakers — and the curtain came down. One audience member in the second or third row responded to the theatre's call for medical assistance. He was back in his seat not soon thereafter. Karl, 43, returned to the stage approximately 15 minutes later, visibly limping and using a makeshift cane fashioned from a bamboo prop to help him walk. After finishing out the musical's final 10 minutes, he took his final curtain call bow — though appeared to be in tears. 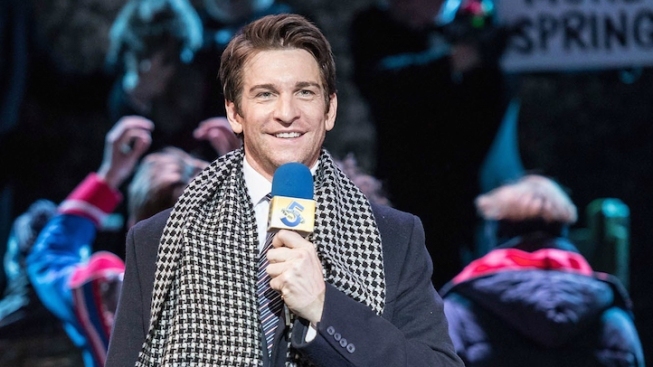 "At approximately 10:30 p.m. in the second act of 'Groundhog Day,' during the song 'Philanthropy,' Andy Karl injured himself during the performance and left the stage. The show was stopped. Andy insisted on finishing the show and after a 15 minute break went on stage with a cane. Following the performance Andy was taken to see a doctor. We will update you on further news as we hear it." Thank you for all the love & kind words and please keep sending good thoughts. Karl's accident comes days after he was awarded the Olivier Award for Best Actor in a Musical. The London equivalent of the Tony Award, the prize went to Karl on Sunday for his role in "Groundhog Day" — which premiered at the Old Vic in the summer of 2016 to rave reviews. Adapted from the 1993 Bill Murray comedy, "Groundhog Day" tells the story of a cranky TV weatherman Phil Connors (Karl) who gets stuck in a time warp while covering the Groundhog Day ceremonies in Punxsutawney, Pennsylvania — reliving the same day over and over again until he gets it right. It's score comes from "Matilda" composer Tim Minchin with a book from Danny Rubin, who also co-wrote the screenplay to the original film. Matthew Warchus directs. Ticketholders for Saturday's matinee should contact their point of purchase for refunds and exchanges.